In years past, the conventional wisdom on the integration process advocated a slow transition. The rationale went like this: This is important. We must move slowly, carefully, and minimize mistakes. We can’t afford to overwhelm people with change. It all sounded so logical. It seemed like such a caring approach so far as the people were concerned. The problem is, the thinking was dead wrong. Basically, employees hate a slow integration process. The approach lets problems fester, and it fails to take advantage of the energy stirred up by a merger event. 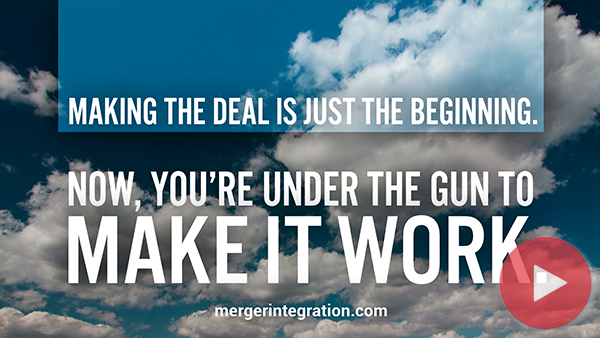 Being careful during mergers and acquisitions means moving quickly. Speed is your ally. A rapid integration approach that reflects a strong sense of urgency holds far more promise than a strategy based on caution. The mistakes that come from going fast are nothing compared to the problems of going too slow. Just imagine the impact of a 20 to 30 percent drop in the effectiveness of a sales organization when the integration process drags on for six months or so. What if the transition lasts 24 months instead of 6? What if the productivity drop is 50 percent instead of 30? Slow transitions have a significant damaging impact to the bottom line. At the very outset, it is important to set the expectation for moving quickly through the integration process. The parent company should convey an image of urgency, demonstrating that the new regime is action oriented. The “opening moves” should be designed to illustrate the pace the acquirer intends to maintain. Appropriate initial steps communicate that the new organizational framework will not be a do-nothing, life-as-usual setup. It also should be emphasized here that the employees of the acquired company will draw their conclusions about the parent company by observing what it does, rather than from listening to what its senior executives say. In fact, there will be a great deal of skepticism regarding what the acquirer says or writes, whereas anything actually done represents hard data. The question that should be posed, then, is “What is fast?” Some organizations might speed up noticeably yet still fall far short of showing the metabolism needed in the integration process. London Life Insurance Company of London, Ontario (Canada), provides a good model. London Life acquired the Canadian operations of The Prudential Insurance Company of America. The marriage of these two organizations was no simple task, with nearly $20 billion (CN$) in assets involved. But London Life and The Prudential of Canada went to work early and quickly. On a single day, six full weeks before the announcement was made, integration planning gained momentum. It started at 8 a.m. one Tuesday morning. By 10 a.m. the structure was defined. By 2 p.m. people were identified for each task team and notified about their assignment. At 6:30 p.m. a dinner was held for a collection of 30 senior managers and task-force members, many of whom were hearing about the acquisition for the first time. At dinner, the approach was presented and modified. The next day, task forces that had been formed met to begin planning for pre- and post-announcement integration. All of this speed on the front end led to an extremely successful announcement in which questions from employees, the media, analysts, customers, and suppliers could be answered in a definitive manner. This fast start allowed the integration to move forward much more quickly than originally thought possible. The success in this case was due largely to expectations for moving rapidly being established upfront. In addition, senior management openly acknowledged that some mistakes undoubtedly would be made, and they asked for forgiveness at the very beginning of the transition. While speed and efficiency during an integration are important, effectiveness is just as critical. The announcement of an acquisition introduces new information to an organization. It changes the landscape. This requires a reevaluation of existing activities. Organizations will find that, upon announcement of an acquisition, many projects are no longer critical. Others need to be modified or should be delayed in light of new priorities. One large electronics manufacturer that had just been acquired found that an implementation of SAP software could be halted due to capabilities already existing at the parent company. Reengineering efforts, new product launches, R&D efforts, and strategic planning processes can all be affected by a merger or acquisition. Reevaluating priorities early in the process helps prevent concurrent pressures from vying for people’s time and energy, while ensuring that the most financially beneficial initiatives are pursued first. Unfortunately, large transitions such as mergers are by nature riddled with problems. These difficulties are not necessarily indications of a poorly conceived merger, bad management, or a weak integration strategy. Instead, they are usually merely signs that a merger is happening. Trying to convince people of this fact is tough. And trying to convince merger critics is nearly impossible. To make things worse, the critics get their “proof ” that the merger is “bad” long before the supporters manage to get their evidence to the contrary. Mergers invariably produce a set of generic problems, and the antimerger crowd uses this to support its case. To battle this strong negative sentiment, it is important to engineer some early wins. In other words, management should quickly identify some easy ways to capture successes, make sure those successes are achieved, and then publicize them widely. For instance, one large, international computer reseller was able to take advantage of a purchasing system in the company it had just acquired. The company quickly upgraded its software with help from the information systems group in the target company. As a result, it was able to solve several long-standing problems related to accuracy and efficiency in processing purchase orders. The actions were publicized in the company newsletter as evidence that the combination of the companies could be beneficial. In another case, a large Fortune 50 manufacturing company quickly approved the investment of $100,000 for a new manufacturing line to be located at the acquired organization’s site. This was an early win for both the acquirer (it normally took six weeks for capital approval) and for the acquiree (they sorely needed the excess capacity and enhanced capability). Major organizational change causes a company to become more introspective. This is especially true during merger integration. Once a deal is announced, the focus of both organizations turns inward. Because of this internal orientation, companies often get distracted from the actual running of the business. The most vulnerable areas of the organization are sales, service, and information systems—that is, the key contact points with the customer and the infrastructure that supports them. Many organizations experience a drop in sales and increased complaints about customer service shortly after a merger. It’s something merging organizations can ill afford to let happen. The company is already caught in the glare of the spotlight, with analysts, management, employees (of both organizations), and customers all studying how the deal will affect business. If sales and service start to suffer, people blame the merger and typically begin to question the viability of the decision to merge. Moreover, customers begin fleeing to competitors, complaining that service has now been abandoned by the merging organizations. Shareholders get spooked by noise from the analysts and dump their stock. Employees may jump ship because they fear for the company's future. Management must see that these key areas are protected. Special attention is needed to protect sales and maintain service standards. The situation calls for new initiatives—high-powered programs that catch people’s attention and produce results. This might include short-term sales incentives or merger training and information for customer service personnel at help desks and call centers. Another possibility might be special advertising aimed at communicating to customers the newly merged organizations’ commitment to service. Whatever the particular prescription, actions to boost sales and service must be deliberately planned and quickly executed. In particular, changes that are widely recognized as sorely needed and long overdue can be made concurrent with the integration. Of course, the importance of proposed changes must be weighed against integration initiatives. More often than not, a few changes will have long been recognized as having tremendous financial implications and strategic value. Now is the time to capitalize on the instability and get these changes implemented. Executives should challenge the workforce of the acquired company by setting fresh and somewhat higher standards of performance. This is a highly appropriate time to make people stretch. As already mentioned, mergers and acquisitions cause people to examine their behavior and reevaluate their modus operandi. This introspection, plus the destabilizing effect of the merger/acquisition, causes them to be much more open to behavior change. Astute executives will seize this opportunity to call more of the employees’ potential into play. It is important, however, that any new and more demanding standards of performance be communicated clearly. And parent company executives should express confidence in people’s ability to measure up. It is not enough to just notch up the bars so that the hurdles are higher. Employees must grasp the idea that the parent company believes in them and their ability to make the grade. Most people upgrade their performance automatically when confronted with a leader who expects more of them and expresses confidence in their ability to measure up. What so frequently happens in the post-merger setting, though, is (1) expectations are not communicated clearly at all, and (2) employees in the acquired firm somehow get the idea that the parent company views them as less capable or as possessing questionable ability to meet new performance standards. As a result, people in the acquired firm become less motivated and suffer a loss of confidence. Generally speaking, employees would prefer to contend with higher performance requirements that are made clear rather than blurred, ill-defined standards that aren’t particularly demanding. They just want to know how the measuring stick works and who will do the measuring. Finally, they respond favorably to high expectations when it seems that top management genuinely has faith in their ability to achieve them. Just as people can be challenged to perform better when they are confronted with more demanding expectations, they also are motivated to upgrade performance when they are given a clear sense of direction. The acquirer who steps forth promptly to structure organizational goals for employees provides a crucial focus for organizational resources. Many of the conventional problems associated with mergers and acquisitions are a direct offshoot of people going off on tangents, operating in a fog, or essentially shifting into neutral for lack of well-defined goals. Research has proved convincingly that resources, whether individual or organizational, will gravitate toward clear goals. But employees in an acquired firm routinely are left to operate for months without any clearly defined targets. Parent company executives may intend for the acquisition to continue running on the same set of tracks in pursuit of the same corporate objectives. But incumbents frequently are not convinced that this is really the case, even if the new owner says so. Employees are inclined to remain skeptical until it is obvious that the acquirer understands what the existing goals and objectives are and reaffirms these in writing. For most people in an acquired firm, the acquisition is a threatening experience. It creates feelings of uncertainty. In fact, when top management is simply taking some of the steps recommended here—for example, communicating more demanding expectations or establishing a new corporate direction—employees grow more uneasy. The natural tendency is to become more inhibited in work behavior. People move more cautiously and are less willing to take reasonable risks that would actually benefit the organization. Parent company personnel frequently foster inhibitions and fuel employee concerns unintentionally. This happens when their attitude toward people in the acquired firm is impatient, critical, or condescending. Mergers make people at all levels more hypersensitive, and their pride is easily injured. It takes very little provocation to put them on the defensive or demotivate them. Parent-company executives should take pains to establish and maintain a congenial climate—that is, one that is encouraging, supportive, and positive. All of the people in the parent firm who will have direct contact with acquisition employees should be given formal coaching on how to best enter the acquisition and how to interface with people there. Personnel from the parent firm should be instructed to take advantage of any opportunity to praise individuals and groups—publicly, privately, in writing, or in person. The new organizational climate should be affirming rather than critical, encouraging rather than threatening, challenging rather than inhibiting. Employees in the acquisition respond best when given a feeling of importance. Many employees in the acquired firm will be frustrated with the feeling that they have to prove themselves anew to a cadre of unfamiliar executives. This frustration is further aggravated if the acquirer descends on the target firm like an invading army that has conquered and is sending in occupation troops. So it’s a time for humility on the part of all representatives of the parent firm, as well as a time for ego-building efforts to be directed toward people in the acquisition. If the new workforce is to be integrated, truly merged, then generally the sooner the better. People in the acquired firm need to be given a sense of citizenship in the new corporate structure. Demotivation rapidly sets in when top management in the parent firm chooses to straddle the fence, neither assimilating the workforce nor confirming that it will operate as an independent acquisition. Companies suffer a loss of identity upon being acquired, and with that loss there usually is an erosion of commitment. Motivation deteriorates as “the company” becomes a less well-defined entity to which people can maintain an emotional attachment. Furthermore, personal ties to upper-level managers or the owner may be severed as these people leave the scene, eliminating important personal loyalties that previously generated strong motivational forces. Of course, there are some companies whose acquisitional philosophy has done little to threaten corporate identity. They make a deliberate effort to let acquisitions keep their individuality. Each subsidiary continues to use its own name and company colors. If the acquisition’s old corporate identity is to be eliminated, however, the parent (or surviving) firm has an obligation to bring acquisition employees into the fold. They need to be given a sense of the parent company’s history and indoctrinated with its values, norms, and corporate philosophy. Naturally, this should be done in such a way that does not offend. It should not be delivered as propaganda or look like an attempt to brainwash but should represent an honest and businesslike effort to communicate the new corporate culture and the role the newcomers will play. Immediately after the deal has been consummated, all echelons of management in the acquired company need a redefinition of their authority, reporting relationships, and accountability. Additionally, they should be given a crystalclear understanding of the standards of performance they will be expected to achieve. These steps should be taken as quickly as possible after the consummation of the deal. If necessary, the acquirer should sacrifice detail for speed. The main thing is not to leave acquisition employees operating in a vacuum, or some will do nothing while others do wrong. Either way, they usually create secondary problems that then must be addressed. These are the causes of so many post-merger brush fires that distract top management from maintaining a major focus on corporate integration. It is commonplace for an acquirer to assume that it has done a satisfactory job of communicating to people who’s in charge, who reports to whom, and what’s expected of everyone. But people constantly complain about confusing lines of authority and an ill-defined power structure. Employees feel they are operating in too much of a fog. The situation breeds frustration and tangled relationships, with the result being still another blow to employee motivation. Acquirers should recognize that, until these issues have been sorted out, people cannot complete the adjustment process and become fully reconciled to the merger/acquisition.